Mint! Rare! 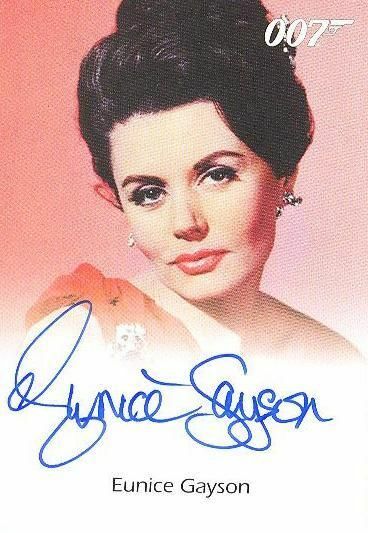 This is the Eunice Gayson as Sylvia Trench in "Dr. No" full-bleed autographed trading card from the 2009 James Bond Archives trading cards produced by Rittenhouse Archives! This style of autograph card continued the very popular full-bleed style of James Bond autograph cards. This style of card was found only one in every 12 packs, so each one is fairly rare. This was a LIMITED autograph, meaning Ms. Gayson signed 500 or less of this card! For more information on the set of trading cards that this autograph card is associated with, please read my review at: 2009 James Bond Archives Trading Card Set Review! Purchase any two sets/cards from the 2009 James Bond Archives inventory and receive a free promotional card from the set (while supplies last)!